This is the very first Zonda 760 Roadster, I saw the frame under construction during a visit inside the factory the day of the Vanishing Point start in June 2014. Thanks to the latest pictures on Instagram the car seems to have been completed in last month. This Roadster is characterized by the classic two-tone colour combination, in this case is very similar to the Zonda Tricolore, fully visible carbon fiber, half clear coated and half with a thin layer of blue paint. The spoiler has a tricolore stripe in the central part while it is not present in the rest of the bodywork. The cockpit is finished in red leather but from these few pictures is difficult to judge. A special feature of this car is that it is the first 760 not to have led lights. For the moment the car has been pictured only with test wheels so their color, brake calipers, more details of the interior and the country of destination are unknown. 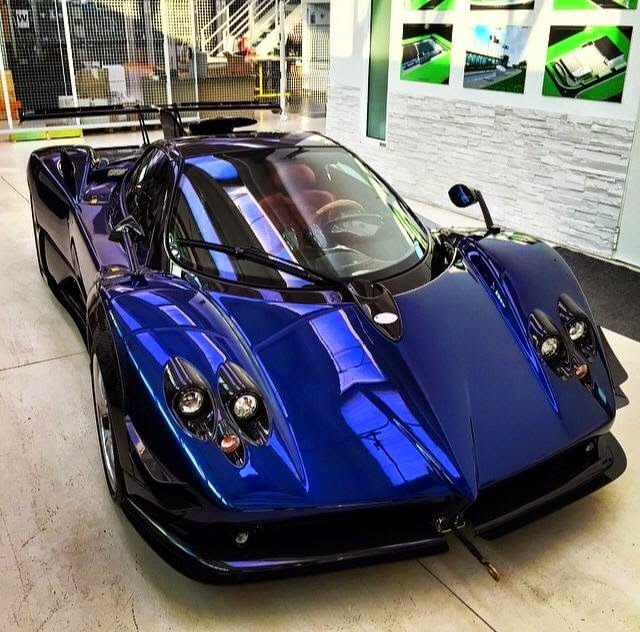 For the moment this is the last Zonda built but for what I know other Zonda will be produced. Finally, a Zonda without many customizations, they were annoying. But this is my own opinion. "Finally, a Zonda without many customizations, they were annoying. But this is my own opinion." Agreed. It's very classy. No stupid color accents, or unnecessary add-ons.